I'll be hosting an online seminar for MarketingProfs on July 14: Making the Customer the Center of What We Do. Nielsen has a new report on media habits, and it looks like television viewing is as strong as ever, with some exceptions for age. And if you add it all up, Americans spend 10 hours 39 minutes a day consuming various types of media. And while people do like watching online video, they're less likely to get their hard news via online video, preferring text instead. Lifestyle videos tend to be favored. All of this video is good news for advertisers and the ad tech industry. Currently, programmatic TV ad spending accounts for just one percent of total TV ad spending currently; but by 2018, programmatic will account for six percent of the total. Programmatic advertising stands at something of a crossroads. There’s little doubt it will take hold in media and marketing, and yet it's suffering from a crisis of confidence. What to do? It's Digiday's Programmatic Manifesto. An essential read if you'd like to get a handle on the market and the issues facing it in the near term. Analyzing 200 million shares, SumoMe determined where you share your content and where your visitors share your content are two totally different places. They looked at the 70 different sites and put together a social sharing best practices guide. Walmart has Amazon in its sights, as the retail giant offers 30-day free trials of ShippingPass, its answer to Amazon Prime. Changes in how and where we read are pushing us to seek out reliability cues wherever they exist, and readers make many judgments about the journalism itself when evaluating a story’s credibility. Makes perfect sense. Until you see that BuzzFeed is closing the gap with The New Yorker. WPP spends a lot of money on media. Last year, the advertising entity spent $1 billion with Facebook. That's expected to increase by nearly 70% this year, making Facebook the second largest media relationship with WPP. Personalization is all the rage. Online it's one thing, but when it occurs in a retail environment, it may move from cool to creepy. For example, scanning a product on your mobile device to see recommendations and product reviews — that's cool. Facial recognition technology that identifies you as a high-value shopper? Creepy. Google is adding WebVR and VR Shell to beta and dev versions of Chrome on Android, potentially allowing all websites to be viewed in VR. Google wants your permission to track you so it can better target ads to you.That doesn't sound creepy at all, does it? Related: I joined Bob Knorpp, Mitch Joel and Peter Shankman on The Beancast and this was one of the topics we discussed. Facebook is using your phone's location to suggest new friends to you. That doesn't sound creepy at all, does it? Facebook is adjusting the News Feed algorithm to favor friends and family over publishers. Facebook notes that the News Feed should inform and entertain. Publishers, prepare your ad budgets — it's going to get harder to be seen. In practical terms, this simply means that you need to do just as Facebook recommends: inform and entertain, but also keep your eye on video and know what content is shareable. In the US, Facebook users can now create fundraisers for nonprofits. Nonprofits that are interested in allowing people to fundraise on Facebook need to have a verified Facebook page, be a 501(c)(3) U.S. nonprofit and agree to Facebook's page terms. To sign up, visitwww.facebook.com/donate/signup. You can now make "movies" out of your still photos with Facebook's new Slideshow feature, making it competitive with Google and Apple, who have similar functions. Pages can make multilingual updates simultaneously through an automatic translation feature in their settings. Instagram continues to be a success story for businesses. But often, they're leading Instagram rather than the other way around. New tools and analytics have been appearing, but they've been slow in development compared to Instagram's parent company, Facebook. Small businesses get a boost with Twitter's new Dashboard app that allows them to monitor mentions about products, keywords or hashtags that fall outside of @ mentions. Twitter is getting into VR/AR with the hire of a former Apple designer. Twitter's visual experience will likely be a key to the company's future success. One small example is the addition of stickers for photos, which are searchable like hashtags. Given how quickly people scroll by their feed and make snap judgments on visuals, it's a smart move. It's also clearly an effort to keep up with Snapchat. Snapchat is slashing its advertising prices for brands. According to a source, prices will start $100K, instead of $500K. What a bargain! Who's in? Actually, for small businesses, it's more reasonable and there are reasons to consider creating a Snapchat filter. And if you still aren't down with Snapchat, here's Snapchat, for people who don't understand Snapchat. You'd better hurry, though: Snapchat teens are getting turned off by old people encroaching on their territory. That doesn't sound creepy at all, does it? The Huffington Post figured out a how to hack a Snapchat follow button for its readers. Sidewalk Labs, a secretive division of Alphabet, aims to transform public parking and transportation in US cities, making it easier to drive and park, and create hybrid public-private mobility options. Uber is using its drivers' phones to track behavior, monitoring for quick acceleration or heavy braking and providing messages back to them to take it easy.That doesn't sound creepy at all, does it? Uber is giving its drivers' apps and update, making Pandora Music an alternative to radio. The opportunity ahead is that drivers have the ability to brand the ride experience through their choice of an audio experience. Whatever their choices, we hope Uber also gives their drivers unlimited data plans to support mobile streaming music. Hertz will be supplying Lyft drivers with vehicles from its rental fleet. Leaked financial figures show that Lyft is expecting a fairly flat growth rate in the near term. Which may explain why Lyft has hired an M&A banker that is known for helping companies find buyers. Could GM, who already has a $500 million stake in Lyft, be one of those? The National Highway Traffic Safety Administration has opened an investigation on a Tesla crash in which the driver was using Tesla's famed Autopilotfeature and was killed when his car drove underneath an 18-wheeler. The accident is expected to bring up all sorts of arguments, but if anything, it's likely the find that the technology is sound — one that is not unique to Tesla and is shared by many major automakers; our take is that Tesla allows consumers to think they can be inattentive or even not present in the driver's seat. But this accident makes it clear that until every last vehicle on the road is autonomous, there will continue to be accidents. It doesn't help Tesla's case that there was a portable DVD player found in the vehicle and that witnesses say the driver was watching a Harry Potter movie. To be clear, Tesla's Autopilot technology is NOT fully autonomous; it is semi-autonomous. The same way a Boeing 787 is semi-autonomous: the pilot can't join passengers in the main cabin for a nap — there still needs to be someone present in the cockpit. Airbnb's new funding round of $1 billion now makes it the second most valuable startup in the US (following Uber, of course). The company is now valued at $30 billion. With great sizes comes great headaches: Airbnb is suing San Francisco over the city's plan to fine the company for each unregistered listing. Aribnb claims it is a violation of federal law to require short-terms rentals to register with the city. The Associated Press will use artificial intelligence to cover minor league games. It should upgrade and spare its reporters that have to cover the Minnesota Twins. Microsoft's CEO believes that the future of AI will require humans and machines to work together, while Alphabet's chairman cautions people to stop freaking out and look for the positives in AI development. One very positive development: an AI chatbot lawyer overturned 160,000 parking tickets worth $4 million in London and New York with a 64% success rate. Hopefully this bot isn't programmed with Shakespeare's oft-misused quote "The first thing we do, let's kill all the lawyers." The BBC has been using VR and 360-degree video for about a year. During that time, the news organization has developed rapid prototyping to figure out how to crack storytelling and distribution while the market is still young and relatively scattered. What virtual reality will mean for advertising: four questions that brands need to consider before jumping in. According to Andreessen-Horowitz, VR will be the most social computing platform yet. Do you agree? NBC will be presenting 85 hours of virtual reality footage of the Olympics on Samsung devices. VR and AR certainly transform an online experience; but if you don't have the audio that accompanies it, it might fall a little flat. Apple continues to invest heavily in music videos, concert films, and album exclusives to boost Apple Music, which is how it hopes to win the streaming music war. Of course, another option is to block updates of its competitor's app in the App Store, which is exactly what Apple is doing to Spotify. Apple says that Spotify's app violates App Store rules and that Spotify wants "preferential treatment." First Look Media and Slate are teaming up to produce podcasts. Here are the Top 100 Influencers and Brands in Content Marketing for 2016. A fascinating look at how we got to where we are in this infographic of the history of content marketing. It goes back as far as Ben Franklin. As customer expectations are becoming “liquid” and changing at a lightning pace, more than nine in ten companies are struggling to deliver digital customer experiences that exceed their customers’ expectations, according to a new study from Accenture Interactive called Expectations vs Experience: The Good, The Bad, The Opportunity. You've received customer service emails before. But have you received any that allow you to point out six traits of a great customer service email? The with UK leaving the EU, there's a thorny issue at hand: EU privacy standards must be upheld if companies want to continue to store EU data on British soil. A judge in Virginia determined that people should have no expectation of privacy on their home PCs because no connected computer "is immune from invasion." That doesn't sound creepy at all, does it? Copyright seems to be a poorly understood concept among bloggers and even some content marketers. So when you're quoting someone's work, do you need to get copyright permission? You might be surprised at the nuance. A Ford dealer certainly didn't get permission from a game creator when artwork was lifted from a website for material for a sales event. Fingers are being pointed all over, with no one claiming responsibility for this legal oversight. Marketing technology is more than an assemblage of tools and vendors: it's a mindset. Are you ready to take it on? 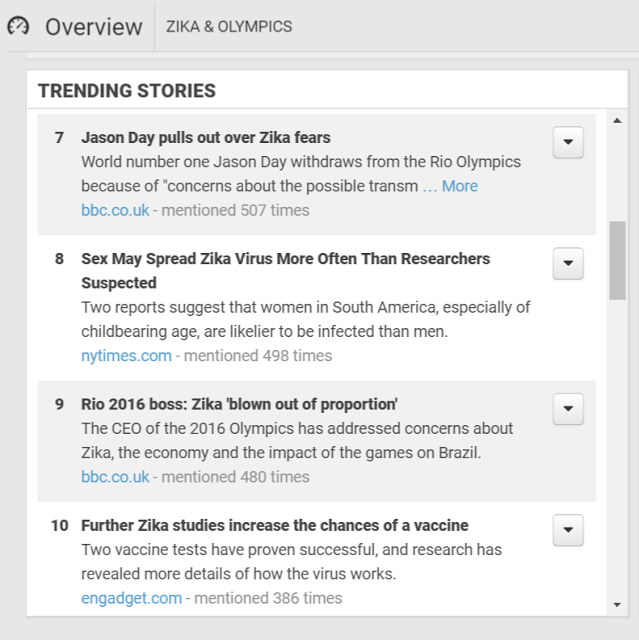 Zignal Labs overview of trending stories shows this would clearly be a concern with item #8 below. Adnan Syed, the main focus of the podcast Serial, saw his conviction vacated and a new trial granted based on new evidence that a listener tracked down. The CEO of Flipboard says its approach to advertising the same as curation: it's all about selectivity. The world is actually much better than you think, in 10 charts. P.G. Wodehouse is one of the funniest writers ever. Check out this interview with him when he was 91. There is a cost to habitual sleep deprivation, yet many companies do not promote healthy sleep as part of a work-life balance. Research has shown that sleep-deprived brains lose the ability to make accurate judgments. I know what you're thinking: this newsletter was probably edited late at night. And you'd be right.